EUGENE, Ore. – Senior Bailey Nelson led the Lady Owls (13-4 CCC, 19-8) to their ninth victory in a row with a double-double this Friday against Northwest Christian (5-10 CCC, 8-16), winning 59-43 and climbing above rival Southern Oregon in conference play. "I thought we played very well in the first half," said Head Coach Scott Meredith. "We had good offensive possessions, had the running game going and had the Beacons on their heels. The three points we gave up in the whole second quarter reflected the outstanding defense played. However, early turnovers in the 3rd allowed NW Christian to make a run. But our team responded, settled down and finished on a positive note. Looking forward to tomorrow nights matchup with Corban." The Beacons kept the game close in the first quarter, with the lead multiple times before freshman Courtney Clemmerand senior Mikaela Shumaker scored two buckets apiece, taking Tech on an 8-0 run to the lead. The first stanza was unique in that it saw the only two three-pointers of the game – both teams struggled from long range, with Northwest shooting at 5% (1-20) and the Owls at 7.7% (1-13). After regaining the lead, OIT pushed ahead even further, outscoring NCU 15-3 in the second quarter to take 32-15 halftime lead. The Beacons fought back in the third stanza led by Morgan McKinney, who added half of their 14 points in the quarter as they outscored the Owls by six with the help of an 8-0 run. However, OIT held the lead, scoring 19-14 in the fourth to finish the game. Senior Nohea Waiwaiole led Oregon Tech in scoring, adding 12 points and grabbing seven rebounds and assists. Nelson fell a point shy with 11 but notched 13 rebounds for the team. Sophomore Amanda Constant and senior Megan Morris each scored 10 points and grabbed five rebounds. McKinney scored a total of 11 points for Northwest, only passed by Hannah Eddens, who took game high honors with 13 points and seven rebounds. Conner Borigo and Shanay Dotson followed with six points and six rebounds each. Tech held a 46-30 rebounding advantage along with a 13-5 assisting edge. 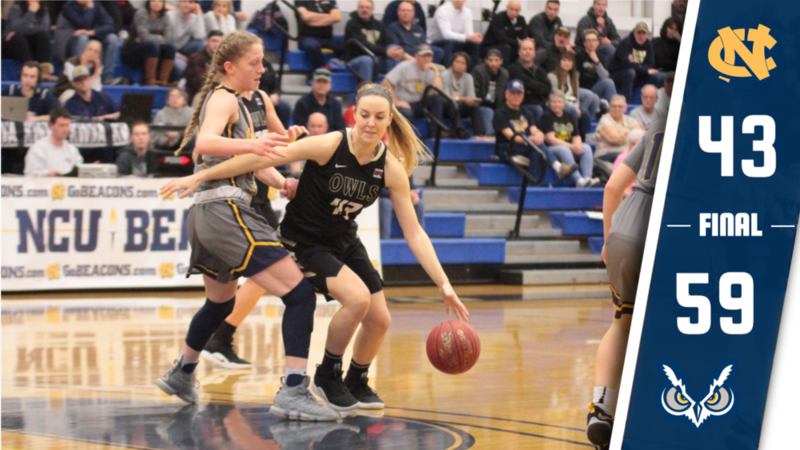 NCU forced 20 turnovers while committing only 18 of their own, but the Owls managed to outscore them 24-13 in points off turnovers. The Lady Owls will play Corban University in Salem, Oregon on Saturday night at 5:30 pm before returning to Klamath Falls to take on Eastern Oregon University Friday for Blackout for Hunger night and The College of Idaho on Saturday, with both games starting at 5:30 pm at Danny Miles Court.